[Comics] as Reading – Chapter 3 – Discipline, Langue, and Play in the Discourse of [Comic] Studies pt. 1 | What is Manga? Culture, tradition, ideology, personal qualities, etc., will all influence the choice of resources artists will make. Nevertheless, each analysis of comics has to start with a study of the form in which it is being published. I imagine—for I can only ever imagine you, my dearest of dear readers—that you have become increasing irritated, annoyed, angered perhaps at my persistent recourse to non-[comic] or only tendentiously [comic]-like things in a book that, so its title proclaims, should be about [comics]. In the case that you are one of those people (e.g. yours truly) who skips to a chapter without even reading much less digesting what has preceded it, permit me to preface the following argument concerning how [comics] are constructed as an object of analysis within [comics] studies discourse by noting that for my purposes any textual artifact can be understood as both what is typically referred to as “the text itself” (i.e. a book or poem or refrigerator or menu board) and the discourse of it, how people regard that artifact and by grouping it with other things of that kind construct (and revise) a framework for understanding it. I reiterate this point I have already made, because [comics] studies, like any academically minded critical domain, for the most part understands itself as aloof from its object of analysis and, more importantly, aloof from any construction of a historical or socio-cultural or ideological context within which one is to understand that object. In other words, none of the now numerous historiographic treatments of [comics], as far as I can tell, has presented itself nor is understood as publishing the very [comics] it observes, re-presents, and aligns with regard to a particular historical outlook. Nevertheless, the assumption underlying ordinary [comics] historiography and analysis is that a particular [comic] strip comes from an early 20th century American newspaper and not a reprint anthology from 50+ years after the fact, even where this anthology is what the essay at hand draws upon for its own critical reproduction. The task of scholarship, one presumes, is to at least identify the earliest iteration of the [comic] under consideration, even if no artifactual example of it survives, so as to establish it as primary and burden it with the designation of “original.” This practice then leads us into the rather tendentious understanding of that first iteration as the [comic’s] production and everything thereafter as a mere reproduction. Yet, bookthink persists in [comic] studies in part due to, one supposes, a belief that doing so does no demonstrable harm to scholarship. Certainly, if you consider a text such as Alison Bechdel’s Are You My Mother?, conceived of as a complete and discrete volume–N.B. I will undermine this point somewhat in the final chapter–and published as such by Houghton Mifflin Harcourt, bookthink appears to be not at all inappropriate. One could raise objections about editorial process similar to those I allude to above, but in the end it would not terribly upset to conceptualize what one holds in her hand as a “book.” In fact, Bechdel’s consistent depiction of herself as writer (and reader) [above], typing away at a document at her computer as she speaks with her mother on the phone, reinforces the notion that what one is reading, despite being a [comic], is just another work of fiction in the ordinary sense. Bechdel does, of course, show herself drawing in this text, but only rarely, and even then far more often as a child than an adult. An analysis of Bechdel’s representation of [comic] artist as writer/reader is certainly worth exploring but is a digression I have no interest in at the moment. Suffice it to say that while bookthink is appropriate in some instances, it is certainly not appropriate in all instances, and what one sees all too often in [comic] studies is a failure to integrate questions of textuality into the analysis being performed. Even in cases where conditions of publication are under explicit consideration bookthink all too often rules the day. This is by no means a novel claim, and I am simply applying a long standing concern over the place of textual studies in the entire range of the humanities to the more limited domain of [comic] studies. There was even a time when scholars believed that textual criticism had the power to transform all hermeneutic practices. McGann is speaking from the perspective of literary interpretation, but it is clear from his statement that the issues textual studies raise have ramifications far beyond the “literary.” Yet, nearly three decades later, the situation is not much different. Outside the study of Shakespeare or those critical domains where philological concerns are already at the forefront (e.g. medieval or classical studies), the revolution never came to pass. After the great fervor over “high theory” in the 1980s cooled to a languid fever in the ‘90s, scholars were free to return to their textual naiveté or, worse, willful obliviousness. In a world where scholars are rewarded primarily for producing scholarship as quickly and as efficiently as possible, it is simply in one’s own best interests to internalize a number of critical assumptions and do things in the ordinary way, lest they risk losing themselves in a rabbit hole where uncertainty and painstaking, often unrewarding, work are the order of the day. However, I am more than aware that grandiloquent claims about theory are just that, if one cannot demonstrate what such assumptions do to the practice of scholarship and, for the purposes of this chapter, how those assumptions aid [comics] scholarship in [re]producing its peculiar object of analysis. A seemingly innocuous example: in his Naissances de la Bande Dessinée, Thierry Smolderen uses a Hogan’s Alley [comic] from the September 20, 1896 edition of The World [above] to illustrate what he sees as a clear inheritance from the works of William Hogarth in the [comics] form that coalesced around the turn of the 20th century. 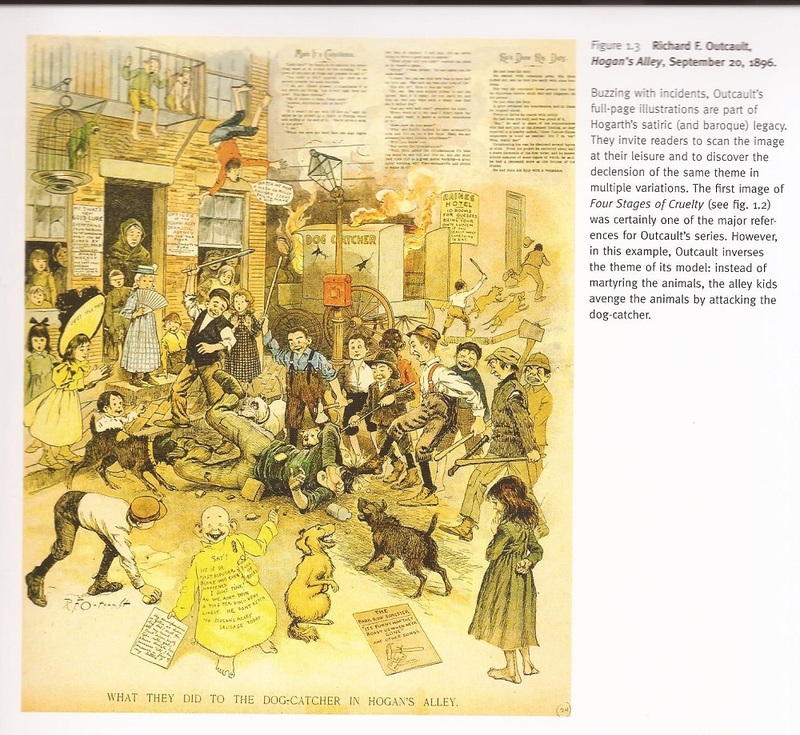 This is not merely an offhand remark about a superficial similarity between two humorous visual forms separated by more than a century, it is an implicit justification for the work as a whole, since the status of Hogarth’s work as an important [comics] precursor is a matter of critical debate, not consensus, a necessary justification for the English reader of Smolderen’s text especially, seeing as the French text’s introduction was intentionally not included in the 2014 translation, Origins of Comics. When I inquired, with mere innocent curiosity, as to the omission, Smolderen (through the much appreciated mediation of Andrei Molotiu) pointed me (and others) to a 2011 essay in a supplement to the journal SIGNs (Studies in Graphic Narratives) as providing the methodological overview much truncated in Naissances and wholly absent from Origins. One could also point to, for instance, the study of Emily Dickinson or William Blake as areas where textual studies have taken hold, but the larger point remains that the radical transformation of what I have referred to as naïve bookthink, as McGann envisions it, never occurred. Textual studies is still broadly understood as especially applicable to the particulars of certain scholarly domains and not to larger concerns about texts and interpretation.